Can Nature-Based Shoreline Practices Improve Coastal Resilience of NY’s Great Lakes Region? 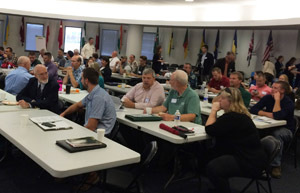 NY's Great Lakes Nature-Based Shorelines Workshop. Rochester, NY. New Yorkers in the Great Lakes region have experienced extreme storm and flood events in recent years. How can Great Lakes shorelines be protected from the effects of extreme weather events and everyday stresses? New York Sea Grant has posted presentations exploring the possible use of natural materials such as sand and vegetation for shoreline erosion management from a recent Great Lakes Nature-Based Shorelines Workshop organized by the New York State Department of Environmental Conservation Great Lakes Watershed Program, New York Sea Grant, Wisconsin Sea Grant, and other partnering federal, state, and county agencies; non-government organizations; and private consultants. The presentations and recordings posted at www.nyseagrant.org/naturebasedshorelines highlight the spectrum of ‘nature-based’ shoreline techniques already successfully used or offering potential application in New York’s Great Lakes region. Nearly 70 coastal scientists, engineers, planners, managers and agency representatives from throughout the Great Lakes region, Gulf states, and Canada gathered in Rochester to hear engineering and natural resource management experts and to discuss opportunities for nature-based shoreline practices for a variety of shoreline types found in NY’s Great Lakes region: beaches and dunes, bluffs, coastal wetlands, and areas with existing protective structures. Demonstration projects presented to examine various nature-based techniques included a popular stretch of Lake Ontario coastline near Sodus Point and key coastal locations vulnerable to flooding and erosion. A panel of US Army Corps of Engineers, NYSDEC, NYS Department of State, and industry representatives provided perspective on the challenges and opportunities for permitting the use of nature-based shoreline techniques in the Great Lakes region of New York. 0 Comments to "Can Nature-Based Shoreline Practices Improve Coastal Resilience of NY’s Great Lakes Region?"